Three weeks ago, the Houston Astros (73-60) sat relatively comfortably atop the American League West with a three game lead over the Texas Rangers (69-62) and a 6.5 game lead over the Los Angeles Angels (66-66). Over the course of three weeks, the Rangers wrangled the division lead in a convincing series over the Astros. Within a week, the Angels did the same by taking two of three from the Astros. As of this morning we find the Astros (80-74) 4.5 games behind the Rangers (84-69) and a meager 0.5 games above the Angels (79-74) for the final wild card spot. As the National League as effectively sorted itself out over the last two days with the Pittsburgh Pirates and the Chicago Cubs guaranteeing themselves wild cards; the American League’s wild card has tighten into a three team race between the Astros, Angels, and in-flux Minnesota Twins. Here, we will break down the remaining schedule to see how their probabilities of making the playoffs are effected. First we take a look at the updated probabilities for all teams making the playoffs, found by taking a Markov simulation over the remaining 128 games, using a Binomial distribution with sampled prior probabilities based on continuity corrected wins and losses from prior games this season. Probabilities of making the playoffs for each MLB team. Given are probability for winning the division (PD), probability for making the wild card (PWC) and probability for making the playoffs (PMP). With ten days remaining of the MLB season, we find that there are still technically 9 teams remaining in contention for the final wild card spot. Sorry, Oakland Athletics! The Tigers, White Sox, Red Sox, Mariners and Rays have seemingly unsurmountable deficits to get back into the wild card spot. For the Tigers and the White Sox, winning out merely gets them to .500 for the season. This means the fifth best team in the American League must be .500. Or more importantly, ten A.L. teams must be below .500. That’s most likely not going to happen. If the Astros go 2-6 or better for the remainder of the season, both teams are eliminated. Let’s say the Astros go 1-7 or worse. Then if the Angels go 3-6 or better, both teams are eliminated. This means the Seattle Mariners, who have 5 of their final 8 games remaining against the Astros and Angels are going to get some wins. At worst this number is 3. This means the White Sox and Tigers have to overcome a 1 game deficit over five games, just to get out of the bottom three spots. This, of course, now requires series sweeps against the Texas Rangers, New York Yankees, and Kansas City Royals. Hence the probability of making the playoffs, while not technically is zero, is effectively zero. The Red Sox can at best finish 82-80 for the season. In order for them to make the playoffs the Astros must go at best 2-6, the Angels must be at best 3-6, the Twins must be at best 4-5. These are records for a required Red Sox sweep against Orioles, Yankees, and Indians. They’re off to a good start with a 7-0 victory against the Orioles last night, but the Yankees aren’t going to roll over for the final series against their arch rivals. Hence the probability of making the playoffs is a meager 0.0001%. The Mariners don’t quite control their destiny despite five remaining gams against Houston and Los Angeles. Last night did not help their case either as they dropped the first of a three game series to the Angels, 4-7. The Mariners can at best finish 82-80 like the Red Sox, but can cause damage by forcing the Angels to no better than a 7-2 finish and the Astros to no better than a 5-3 finish. However, this only helps them move to 1 game out in the grand scheme of things, with three games to go. That’s only accounting for sweeps. But the Mariners can make the most noise in these final ten days of the season to either get a final sniff of playoffs or to completely discombobulate the final three days of the season as they sit comfortably playing Oakland with nothing to lose. Hence the probability of making the playoffs is 0.0011%. Finally, the Rays round out the bottom of the pack as they not only need a near perfect record to get into the playoffs, but also need the teams above them to have near winless records. If the Rays just win each remaining series they finish 6-2, requiring the Astros to go 1-7 and Angels to go 2-7 at best. There’s little chance of this occurring, hence the probability of making the playoffs is a lowly 0.1294%. The middlers are the Baltimore Orioles and the Cleveland Indians. These are both teams within striking distance but still have slim chances for making the playoffs. For the Orioles, they have almost no control over the remainder of the season. Winning their final 9 games of the season gets Orioles to an 85-77 record, good enough for making the playoffs. However, they have to play the Toronto Blue Jays for 4 games. Baltimore is 6-9 against a hot Toronto Blue Jays team that just dispatched the Yankees for firm control of the A.L. East division lead. Combine that with a tough three game series against the Yankees, and the Orioles might at best come away with a 4-3 record against those teams. If the Angels and Astros lose the equivalent 7 games, this puts the Orioles a half game up in the wild card spot. However, this does require the Twins to lose all but two games to the Tigers and Indians. This isn’t out of touch with reality, but it’s a really hard sell to say that the Seattle Mariners (74-80) are just going to mow down the Astros and Angels. Hence the probability of making the playoffs is 0.8670%. For some reason, ESPN is predicting the Indians to have quite a higher probability than the Orioles of making the playoffs, with a tangible 3.0%. While the Orioles have almost zero chance of making the playoffs, the Indians have to overcome two remaining games against the division leading, but stumbling, Kansas City Royals and have a tough four game series against the Minnesota Twins. Last night’s 6-0 win over the Royals certainly helps, but the Indians need to recover three games against the Astros and 2.5 games against the Angels. Coming in to the series, the Indians were 6-9 against the Royals. This would lead us to assume either the Indians will take 1 or 2 games against Kansas City. Similarly, the Indians are 6-9 against the Twins. With the four game series looming, we expect the Twins to again win 1-2 games, possibly a third. This means the Indians should go 3-3 or 4-2 in these six games (2 Royals, 4 Twins) and leaves a three game series with Boston to go. If the Astros or Angeles merely lose series, the Indians will be 1 game out with three to go. Another tall order for a team that barely controls its destiny against teams it has a losing record against. Hence the probability of making the playoffs is a meager 0.5527%. The Twins, Angels, and Astros are the main story here. While the Orioles and Indians have a legitimate chance to sneak in by some series wins and middling from these three teams, this race effectively boils down to these three teams. The Twins, out 1.5 games with 9 games to go, have a 12.3034% of making the playoffs. Their finals series are two against Detroit, three against Kansas City, and 4 against the Twins. The in-flux Twins have had a grand chance to capitalize on Houston’s downfall over the previous three weeks and the Angel’s inching towards the wild card spot, but haven’t truly seized any moment. Back on September first, the Twins were 1.0 games out of the wildcard behind the then Rangers, 4.0 games behind the then division leading Astros. Now, they find themselves 1.5 games out of the wildcard. Over the 24 days, the Twins have made it a point to make no progress. In fact the Twins have gone 10-12 over these 24 days. Now they have no control over their destiny, other than attempting to fend of the Indians, who have been 12-9 over the same period. The Twins will find no relief from the Division-Clinched Royals. The Royals are clinging to a 1 game lead for the top playoff spot against the Toronto Blue Jays and need to win games. This gives the Twins a three game series against the Tigers that they must win. Instead, the Twins dropped the first game 4-6. The Twins have a legitimate chance, but need series wins over the Royals and Twins. Those games give a 5-2 record after seven. But they need to at worst split against Detroit. Finishing 6-3 for the season places hope in other teams to force the Astros and Angels to go .500 to finish their season. Speaking of which, the Los Angeles Angels may only have a 37.0860% of making the playoffs, but this due to the fact that the Angels have four games against the Rangers, while the Astros have six games against Seattle and Arizona. Currently, the Angels are 0.5 games out of the wild card spot with a game in hand. The Angels finish the season with two games against Seattle, three against Oakland and a pivotal four game series against Texas. The respective records against these teams are 10-7, 9-7, 10-5, respectively. The Astros, on the other hand, have a 49.5095% chance of making the playoffs. This is due in part to their 7-14 collapse over the previous 24 days. With the Angels going 13-8 over the same period, this looks to be Los Angeles’ time to take over the wild card lead. However, the Astros has their remaining 8 games against the Rangers, Mariners, and Diamondbacks. The Astros are 4-13 against the Rangers, but 10-6 against Seattle. The Diamondbacks probability was derived from the Interleague records, in which the Astros are 14-3 and the Diamondbacks are 10-7. This gives the Astros an artificial 21-13 record, hence expecting to take 2 of 3 from the Diamondbacks. With the tight race, this is the reason why the Astros’ have a higher probability. Making a change to a .500 Interleague record for both teams, we see the probabilities change drastically: 42.1617% for the Angels, 42.3787% for the Astros. Note that this adjustment let’s the Twins steal some of the probability (about 1%) from the two teams. While the probabilities are higher for the Astros, the average simulation leads to the Angels making the playoffs over the Astros. This is due in part to the juxtaposition of the Twins, Indians, and Orioles getting in compared to the Astros and Angels. The final projected standings are given below. Projected MLB Standings based on Markov simulation. The reason the Angels get in on average is also in part due to a projected one game playoff between the Angels and Astros, with the Angels having a higher probability to win that game. 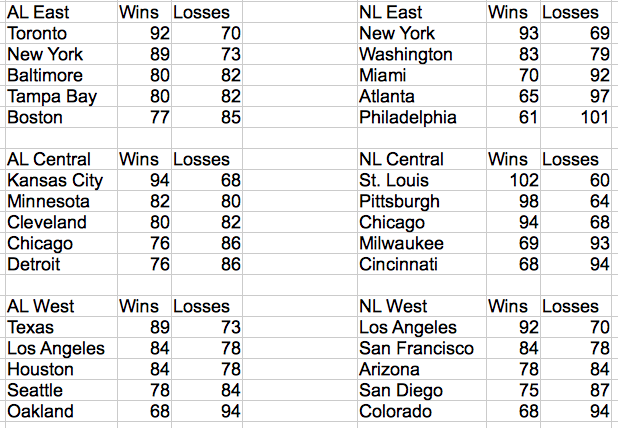 Hope this serves well for a guide to the wild AL Wild Card finish that we will see unfold over the next ten days. In a couple days we will take yet another (fifth!) look at the change in probabilities. Will the Astros get their act back together? Will the Angels continue to surge? Will the Twins or Indians finally make a hard final push to make the Wild Card? Hopefully yes across all fronts. That will be the most exciting finish to this regular season.